The extra security provided openly gay Muslim filmmaker Parvez Sharma at this year’s Hot Docs is an ominous development, but in a perverse way, the death threats prompted by his latest film constitute a ringing endorsement. Nonfiction-filmmaking does not get much gutsier than Sharma video-documenting his hajj. Frankly, it is a bit surprising the ever-so open Saudi government granted his hajj visa. They probably already regret it, but not for reasons you suspect. Ignore the overheated internet trolling and honestly engage with the issues raised by Sharma’s A Sinner in Mecca (trailer here) when it screens again at the 2015 Hot Docs in Toronto. Sharma had already been on the receiving end of a minor fatwa, because of his prior documentary on the Muslim LGBT experience, A Jihad for Love. After marrying his partner, Sharma decided to take his hajj, hoping to reconcile his faith with his sexuality. Of course he will secretly document the process. He is a filmmaker. That is what he does. Frankly, nobody is more aware of the potential danger for an internationally recognized LGBT activist in Wahhabist Saudi Arabia than Sharma. He was consciously risking his life to make the film, but he was completely unprepared for the rampant exploitation and abuse all pilgrims must endure. Much of Sinner would be legitimately horrifying, even if Sharma was not constantly worried his true identity might be revealed. That is why the coda in which he declares his faith is renewed feels completely out of place and inconsistent with everything that preceded it. One suspects that Sharma is trying to convince himself for his own personal reasons. We have to respect that, but the footage he covertly shot (on mini-handhelds and his iPhone) speak thunderously. First and foremost, Sinner thoroughly indicts the Saudi custodianship of Mecca. If you really wanted to be provocative you could argue the global Muslim community would be much better served if Mecca were in Israel, because the Israeli government understands how to respect and preserve artifacts and landmarks associated with other religions (exhibit A: the Dead Sea Scrolls). Regardless, Sharma’s hajj is a very personal act, but his documentation has much greater implications. 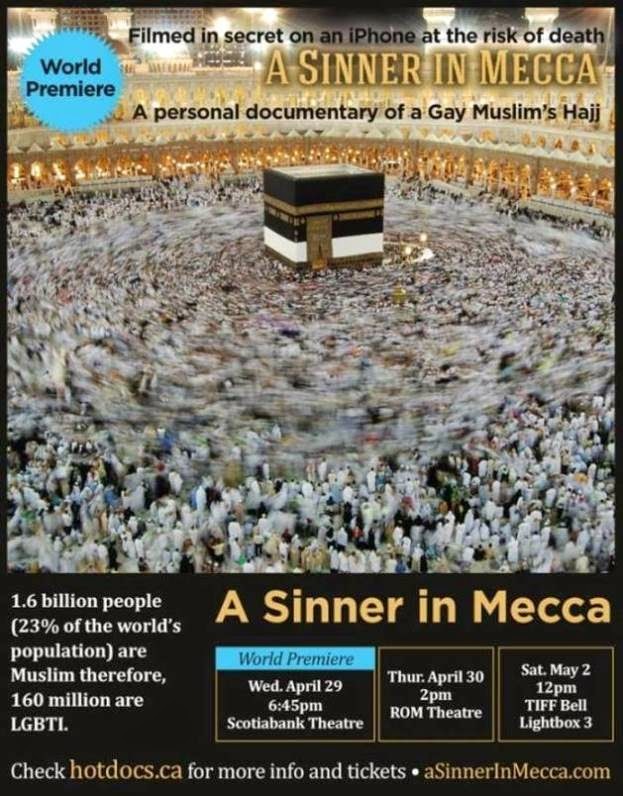 Bold and stingingly truthful, A Sinner in Mecca is very highly recommended when it screens again tonight (4/30) and Saturday (5/2), as part of this year’s Hot Docs.